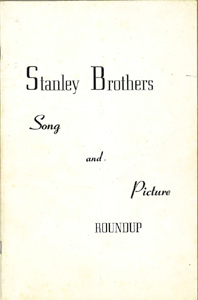 I thought it might be an idea to have a page with copies of the various 'Song & Memory Books' which were produced by the Stanley Brothers or Ralph Stanley... If anybody is able to provide scans of any others (or higher resolution scans), I'd love to make them available here. Needless to say, if you can help. 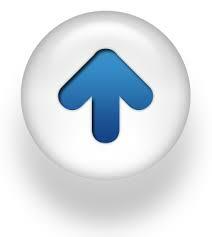 please get get in touch via the Contact page! 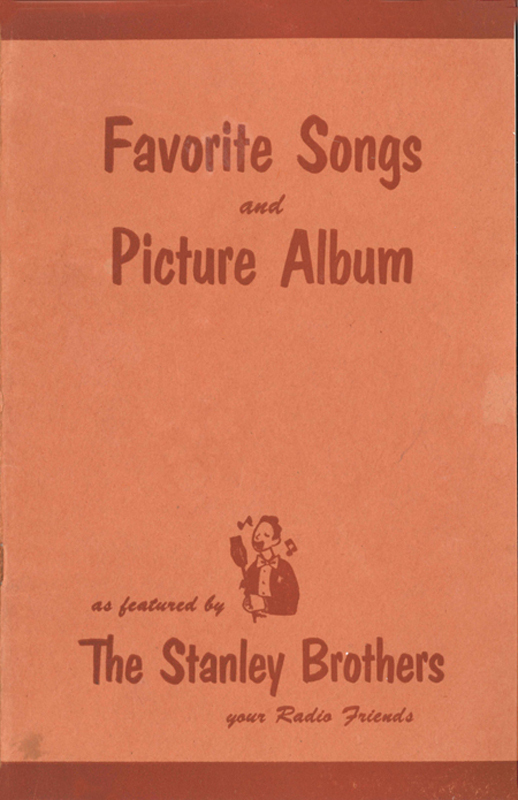 Below are some of the Stanley Brothers song books, thanks to Bill Sanguinetti; plus courtesy of Gary Reid, Ralph's first 'Song & Picture Folio No. 1' from 1969. 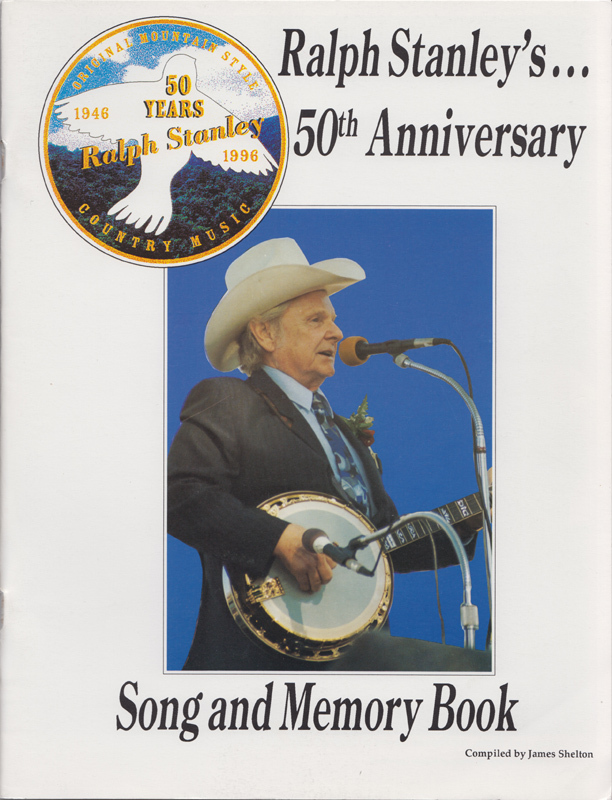 The remaining Ralph's later 'Song & Memory Books' are from my own collection. PS: Because of the size of some of the pdf files, I'd recommend 'right' clicking & downloading them, rather than trying to open them in a browser. This is part of a very early song book, with the surviving fragment containing the lyrics to Mother No Longer Awaits Me At Home from their first Rich-R-Tone 78 (RRT-420), plus the early photo which was also used for the Honaker Harness & Saddlery promo pic. Thanks to Bill Sanguinetti for sending this to me, and allowing us to reproduce it. 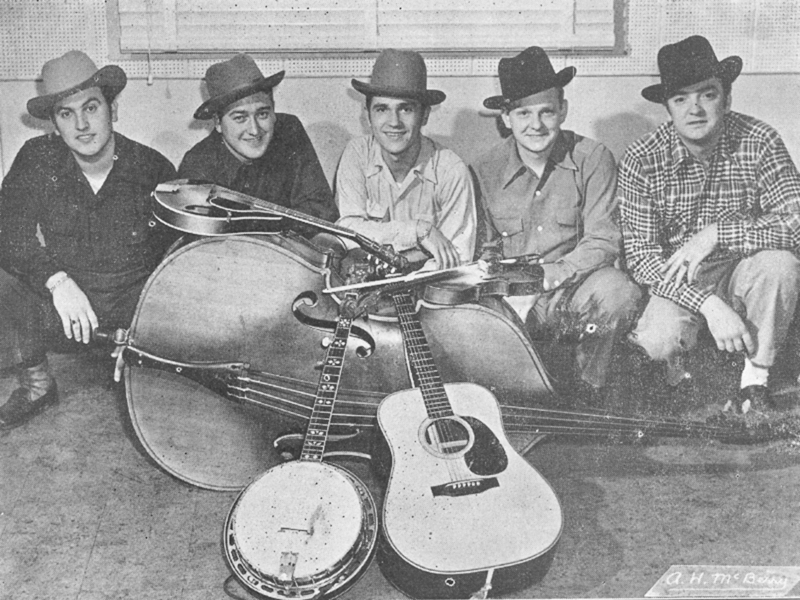 This second 'Folio' features rare pictures of the CMB line-up in the WCYB Radio studios, with their original fiddler Bobby Sumner, Jay Hughes (aka Cousin Winsap) on bass and Pee Wee Lambert on Mandolin. 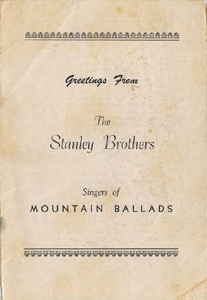 The line-up suggests that this booklet was produced early in 1949, after the Molly And Tenbrook 78 (RRT-418) which irked Bill Monroe, and includes the lyrics to three of the new songs they cut at their first Columbia session in March 1949, plus Little Glass Of Wine. Lyrics are included to: White Dove, White House Blues, Mother No Longer Awaits Me At Home, True And Trembling Motorman, It's Never Too Late, Footprints In The Snow, Pretty Polly, A Vision Of Mother, Come All You Tender Hearted, Coming To Us Dead, I Am A Man Of Constant Sorrow, Be Ready To Go, Your Friends Will Follow, The Roan County Prisoner, Little Glass Of Wine, You're Driftin' On, and Molly And Timbrook (sic). The song choices are somewhat interesting. 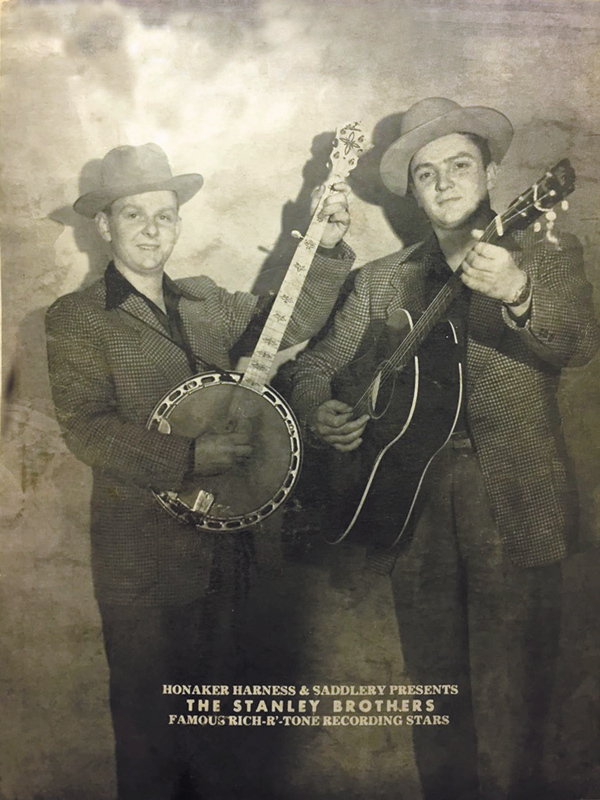 In addition to Bill Monroe's Molly And Tenbrook there's also a version of his Footprints In The Snow, which The Stanley Brothers never got to record. Other songs of note include:- True And Trembling Motorman which the Carter Family had recorded as The Reckless Motorman; Coming To Us Dead (aka He's Coming To Us Dead) which had been recorded by Grayson & Whitter, later cut by Ralph on his Short Life Of Trouble CD; Be Ready To Go which was finally featured on Ralph's 1968 Over The Sunset Hill LP; and You're Drifting On which likewise didn't get recorded until Ralph's 1971 Cry From The Cross album. 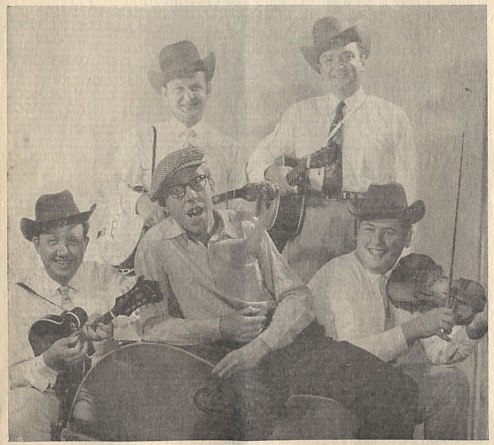 This third 'Folio' features rare pictures of the CMB line-up, with Lester Woodie (fiddle) and Pee Wee Lambert (mandolin). 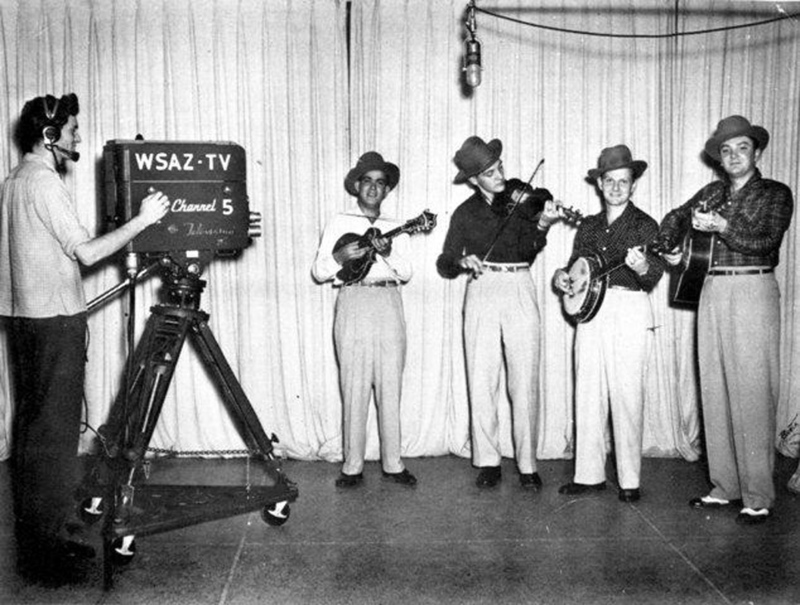 One of the pictures is a cropped version of the WSAZ-TV show in Huntington Va. from 1950 with camera operator George Woody. Lyrics are included to: I'm A Man Of Constant Sorrow, The Fields Have Turned Brown, Lonesome River, You Go To Your Church - I'll Go To Mine, He'll Open The Gate, The White Dove, Too Late To Cry, The Angels Are Singing, That Happy Night, Pretty Polly and I Love No One But You. 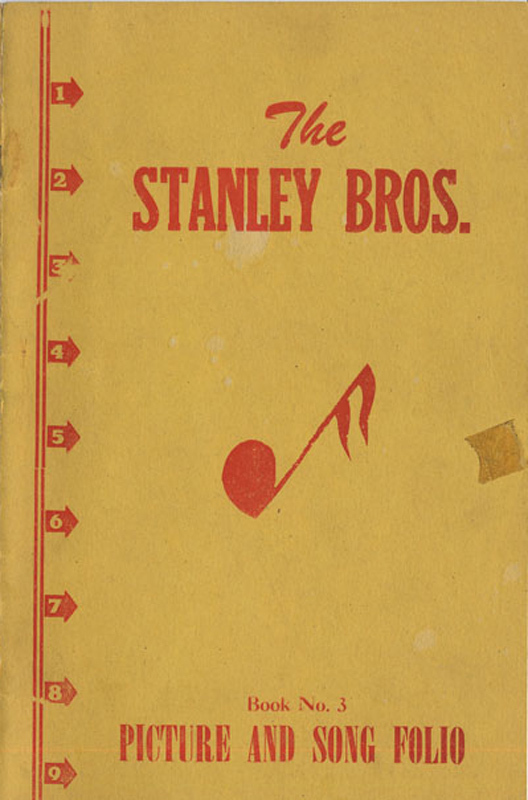 Most of the chosen songs are from the Stanley Brother's 2nd and 3rd Columbia sessions (20th Nov 1949 / 3rd Nov 1950) which featured studio musician Ernest 'Ernie' Newton on bass. 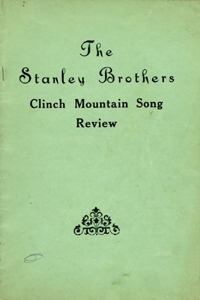 Also featured are That Happy Night, which the Stanley's didn't get to record until the 1959 Starday Mountain Song Favorites LP. Curiously, the Stanley's also never got to cut You Go To Your Church ('though Ralph did help Bill Clifton record the song in 1958) and He'll Open The Gate is a complete mystery. Lyrically it doesn't seem to match Johnson Oatman's 1902 He Will Open The Gate For Me or the Bass Mountain Boy's song He Will Open The Gate... Could it be an unrecorded Carter original? This 'Folio' features rare pictures of the CMB line-up, with Bobby Sumner (fiddle), Charlie Cline (bass) and Bobby Osborne (mandolin). In Gary Reid's essential The Music Of The Stanley Brothers book he says that Bobby Osborne only played with the band for about six weeks, before being inducted into the Marines and the Korean war. 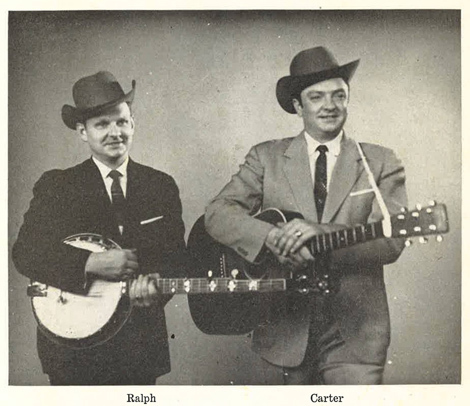 This places this 'Folio' in the latter part of 1951 following on from Carter's stint with Bill Monroe. Lyrics are included to: True Lover's Warning (aka Tragic Love), That Happy Night, I'm Better Off Now That You're Gone, Lonesome For You (aka Lonesome And Blue), Our Last Goodbye, Come Back To The Valley, I'll Meet You In Church Sunday Morning, I Hear My Savior Calling, In Heaven We'll Never Grow Old, Midnight Storm, The Heart You Stole Away (aka This Weary Heart You Stole Away (Wake Up Sweetheart)), The Wild And Wreckless Hobo and My Sinful Past. 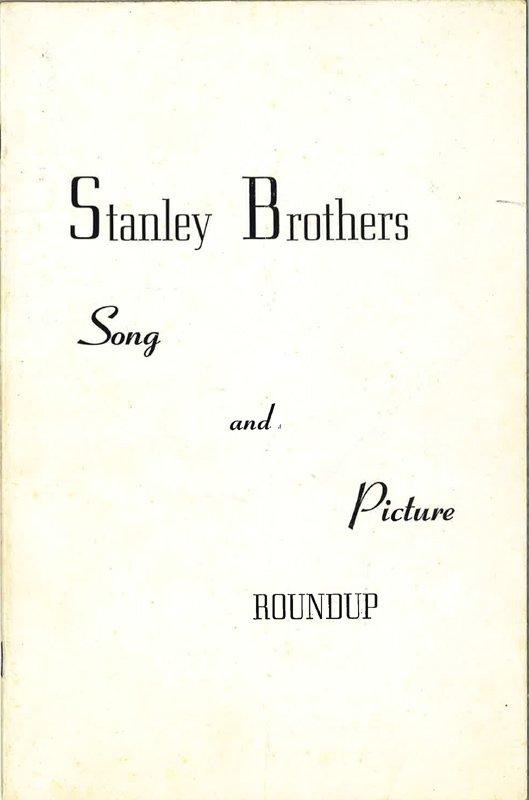 The song selection for this 'Folio' is also quite interesting - although the Stanley's were still signed to Columbia at the time, none of the songs were recorded for that label. 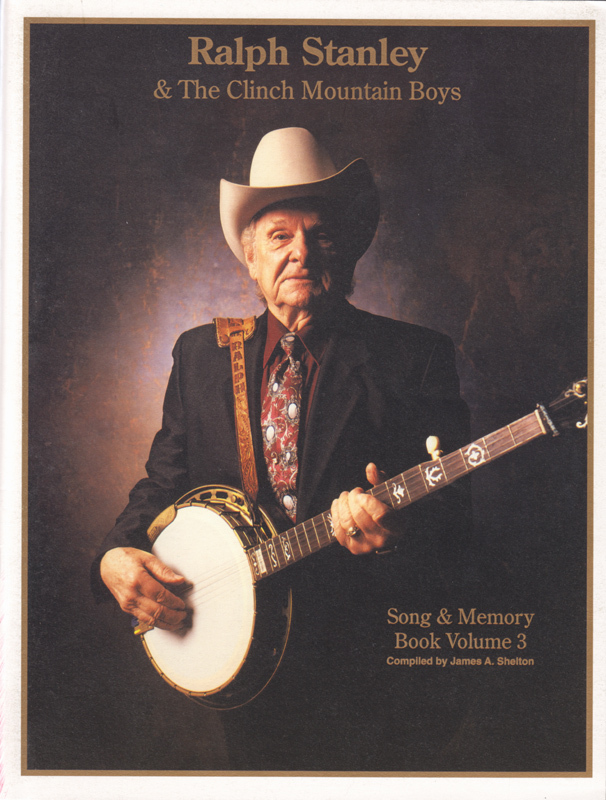 Some of them did however get cut for Mercury:- Our Last Goodbye & This Weary Heart You Stole Away (Wake Up Sweetheart) (Aug. 1953); and Lonesome And Blue, I Hear My Savior Calling, Tragic Love & Bill Monroe's I Hear My Savior Calling (Apr. 1955). 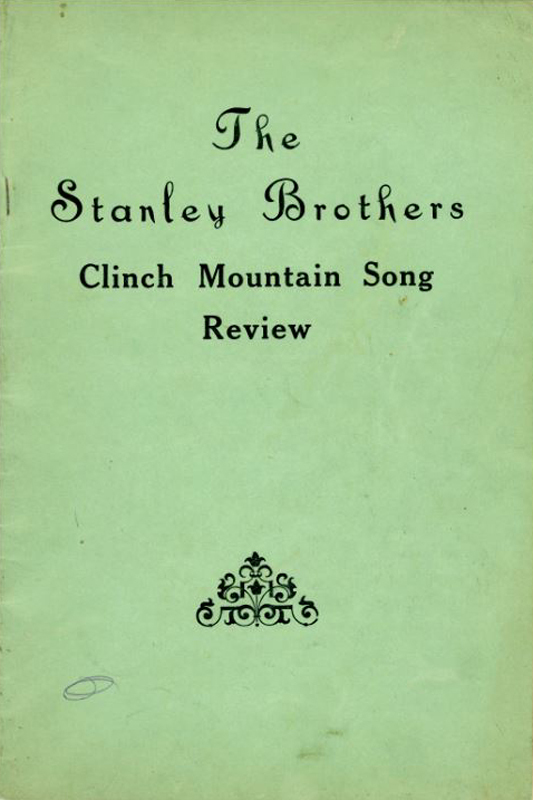 Other's were recorded later with That Happy Night resurfacing on Starday 406 (1958), I'll Meet You In Church Sunday Morning on Hymns And Sacred Songs (1959), In Heaven We'll Never Grow Old on Starday SEP-123 (1960), My Sinful Past on Old Time Camp Meeting (1961) and Wild And Reckless Hobo on John's Country Quartet (1964/5). Two songs were only recorded later still by Ralph Stanley with I'm Better Off Now That You're Gone appearing on his Brand New Country Songs LP and Midnight Storm on the Hills Of Home album. 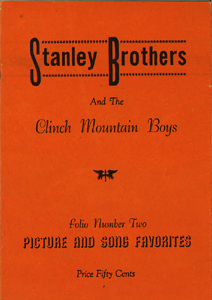 That just leaves Come Back To The Valley which is credited to Carter in the songbook, but doesn't appear to have been recorded by the Stanley Brothers. It is however featured on the Lee Allen - Songs Of Love And Tragedy LP, which featured backing by the CMB's and it's registered on the BMI Music Publishing site as composed by Lee Allen. You can also find this song on youtube. 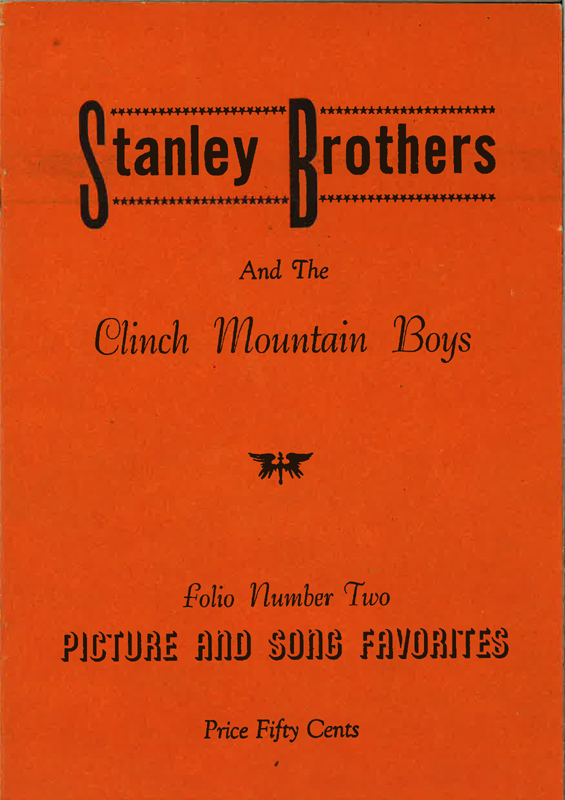 This 'Folio' features rare pictures of from the Stanley Brothers' tour of the Pacific Northwest in the Autumn (Fall) of 1956, and includes a group pic with Chubby Anthony, Curly Lambert and George Shuffler. Lyrics are included to: Let Me Walk Lord By Your Side, In Heaven We'll Never Grow Old, A Voice From On High, A Lonesome Night, Will He Wait A Little Longer, The Angel Of Death, I'd Rather Be Forgotten, Who'll Call You Sweetheart?, I'll Never Grow Tired Of You, I Hear My Savior Calling, Calling From Heaven, Harbor Of Love, Cry From The Cross and The Darkest Hour Is Just Before Dawn. 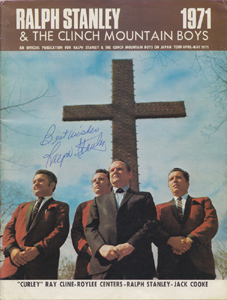 Several of the songs were recorded for Mercury with A Voice From On High (Nov 1953); Calling From Heaven and Harbor Of Love (Aug 1954); I Hear My Savior Calling (Apr 1955); The Cry From The Cross, Will He Wait A Little Longer (Dec 1955, but the latter song remained unreleased until 1971); Let Me Walk, Lord, By Your Side and Who Will Call You Sweetheart (Jul 1956); I'll Never Grow Tired Of You (Feb 1957); and I'd Rather Be Forgotten (Nov 1957). 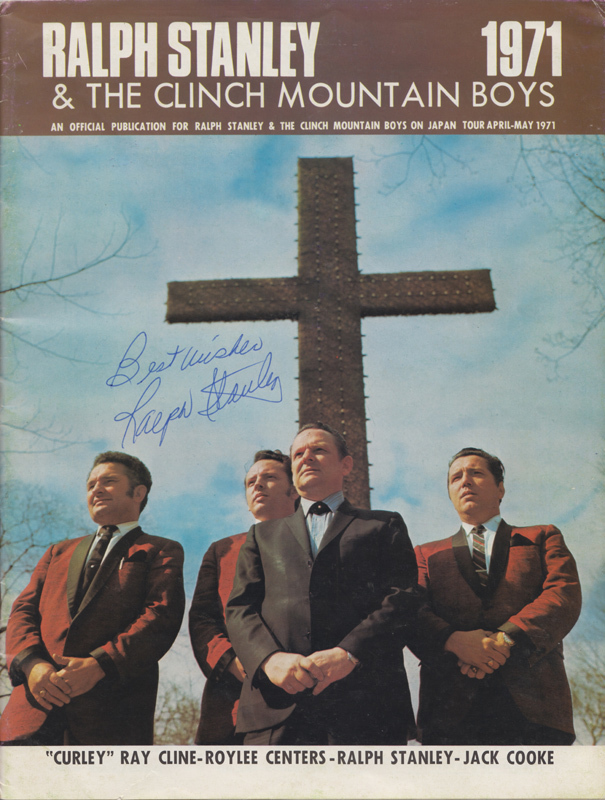 The remaining four numbers were later recorded for Starday / King with The Angel Of Death appearing on Hymns And Sacred Songs (1959); In Heaven We'll Never Grow Old (Starday SEP-123) 1960; The Darkest Hour Is Just Before Dawn on Sacred Songs From The Hills (1960); and Lonesome Night (King 5809) 1963. This 'Folio' seems to date from 1957/58, when the CMB's personnel seems to have been variable. The inclusion of The Flood dates it to sometime after the devastating flood that hit southeastern Kentucky, southwestern West Virginia, western Virginia and northeastern Tennessee in late Jan / early Feb 1957. Likewise the inclusion of Christmas Is Near (titled Christmas Time Is Near) suggests that the booklet was produced before the end of 1958. Lyrics are included to: I Hear My Savior Calling, The Darkest Hour Is Just Before Dawn, Loving You Too Well, Christmas Time Is Near, The Sweetest Love, Could You Love Me, Our Last Goodbye, The Little Glass Of Wine, I Love No One But You, Hey, Hey, Hey, A Lonesome Night, It's Never Too Late, Calling From Heaven, I'm Lonesome Without You, This Weary Heart You Stole Away, The Fields Have Turned Brown, The White Dove, I'm Lost I'll Never Find The Way, The Flood, That Happy Night, Nobody's Love Is Like Mine, A Vision Of Mother, A Life Of Sorrow, I'm A Man Of Constant Sorrow, Lonesome And Blue, The Angels Are Singing (In Heaven Tonight) and I Just Got Wise. 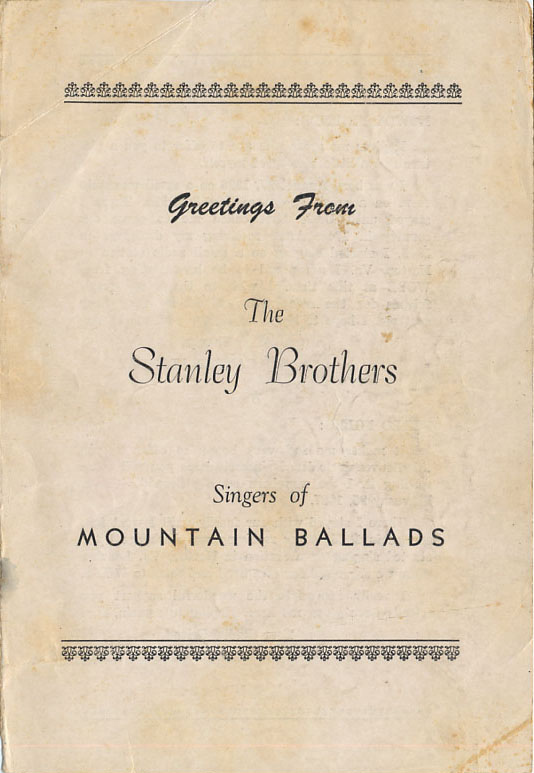 Most of the material is drawn from the Stanley's back catalogue, although That Happy Night wasn't recorded until the Mountain Song Favorites LP (1959) and The Darkest Hour Is Just Before Dawn likewise wasn't recorded until the Sacred Songs From The Hills LP in 1960. 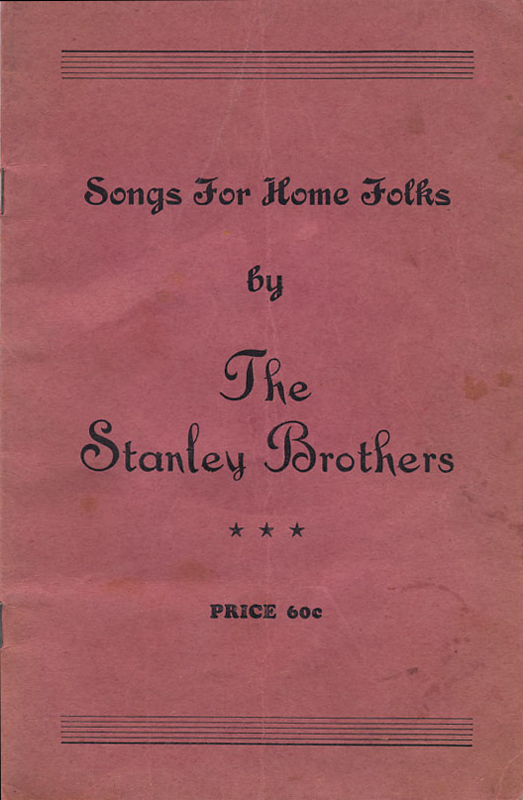 One song, A Lonesome Night had been recorded for Mercury in 1956 but wasn't released until it was re-recorded for the Country Folk Music Spotlight LP in 1963. 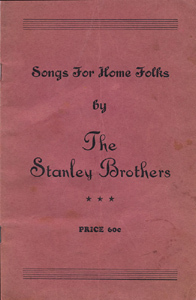 This 'Folio' was produced in 1959 when the Stanley Brothers were sponsored by Jim Walter Homes and appearing on the WJXT-TV 'Suwanee River Jamboree' in Jacksonville, Florida. There's some excellent photo's in this one! Lyrics are included to: White Dove, That Happy Night, Trust Each Other, Keep A Memory, Think Of What You've Done, Christmas Is Near, Highway Of Regret, Who'll Call You Sweetheart, Little Glass Of Wine, So Blue, Life Of Sorrow, Love Me Darling Just Tonight, I'm A Man Of Constant Sorrow, How Mountain Gals Can Love, She's More To Be Pitied, If That's The Way You Feel, I Long To See The Old Folks, A Memory Of Your Smile, Could You Love Me, Angel Band, Wings Of Angels, Let Me Walk Lord By Your Side, Angel Of Death, How Can We Thank Him, A Voice From On High, That Home Far Away, Oh Daniel Prayed, Cry From The Cross, Mother's Footsteps Guide Me On and I Hear My Savior Calling. Many thanks to Bill Sanguinetti for sending this one! 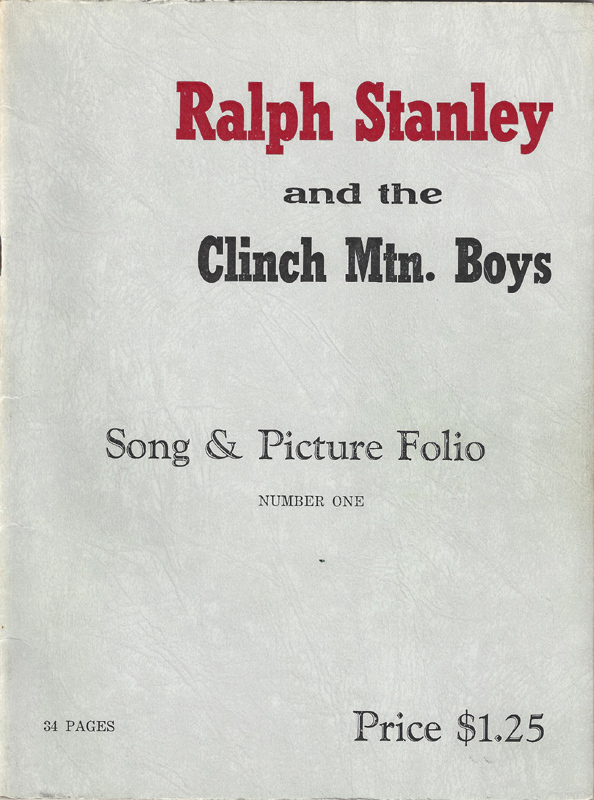 The first of Ralph's songbooks, this one contains the lyrics to 44 songs and came out in the Spring of '69. In addition it also includes a few pictures of Ralph etc. and brief introduction to each of the CMB's at the time. Seventeen of the songs are from Ralph's early solo albums, with:- Carter's Songs and In Memory Of Carter Stanley from The Bluegrass Sound Of...; Lonesome, Sharecropper's Son, I'm Better Off Now That You're Gone, Love Please Stay, Hemlocks And Primroses, World Outside, Sweet Sally Brown and You Could Never Be True from Brand New Country Songs; I Wanna Go Home, What Kind Of Man, I'll Be With Dad And Mother, Prepare Me O'Lord, Over The Sunset Hill, A Little Soldier For Jesus and Thou Long Expected Jesus from Over The Sunset Hill. Two are from Ralph's Hills Of Home LP, which was record later in the '69 (The Kitten And The Cat and Midnight Storm); and another seven are from the final Stanley Brothers studio album A Collection Of Original Gospel And Sacred Songs: I Feel Like Going Home, What A Price, God's Highway, Are You Ready, Vision Of The Promised Land, Take Me Home and Seek Jesus (He Still May Be Found). Thanks to Gary B. Reid for sending this to me, and allowing us to reproduce it. This 42-page tour programme was created for Ralph's first tour of Japan in April-May 1971, which also resulted in the Live In Japan album (and the quickie John Henry LP). If anybody is able to help translate the Japanese text to English, please get in touch via the Contact page - thanks! This 56-page booklet was compiled by James Alan Shelton to commemorate Ralph's 50th year as a musician & his 26th Annual Memorial Festival (23-26th May 1996) which spawned the 50 Year Reunion Video/DVD and Clinch Mountain Boys Reunion 2xCD set. 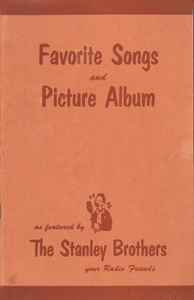 It contains a plethora of rare photo's and lyrics to Stanley classics: Man Of Constant Sorrow, White Dove, If I Lose, Little Glass Of Wine, Lonesome River, How Mountain Girls Can Love, Ridin' That Midnight Train, Little Bennie, Cry From The Cross, Beautiful Star Of Bethlehem, Rank Strangers, Purple Robe, Pretty Polly, Gloryland, Little Maggie, Will You Miss Me?, White Oak On The Hill, Daddy's Rose, In His Arms I'm Not Afraid, The Darkest Hour Is Just Before The Dawn, Room At The Top Of The Stairs, Old Richmond Prison, Nobody's Love Is Like Mine and A Little Boy Called Joe. 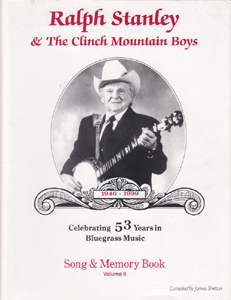 The booklet had three print runs, and in 1999 it was decided to update it as 'Vol. II'. This was an updated version of the 1996 'Song And Memory Book' which had sold out of three print runs. 56-pages with largely the same photo's and song lyrics, but obviously updated to include more recent events like the successful Clinch Mountain Country 2xCD set and Ralph II's burgeoning solo career. 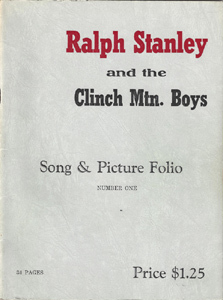 This another update to the original 'Song And Memory Book', post 'Oh Brother...' when Ralph was finally getting more mainstream recognition, being inducted into the Opry etc. 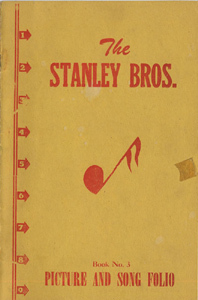 As with 'Vol. II' must of it is the same as in the original booklet, but with 60 pages there are some newer additional / changed photo's. 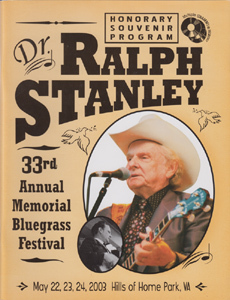 This is a lavish 90-page 'Honorary Souvenir Program' which was made for Ralph's '33rd Annual Memorial Bluegrass Festival' 22-24th May 2003. It mainly concentrates on Ralph's success in the wake of the 'Oh Brother...' movie. A large part of it feels more like a glorified press kit, lacking the down-home intimacy of the earlier books which James Alan Shelton compiled, but it none-the-less provides an interesting snap-shot of Ralph's most commercially successful period.